Mark your calendars! Avril will make her debut performance of “Head Above Water” on Jimmy Kimmel LIVE Wednesday, September 26. The show airs on ABC at 11:35 Eastern /10:35pm Central time. I’ve also created an “Upcoming TV Appearances” post in the sidebar for you to keep track. Avril is continuing to bring the strong messaging of ‘Head Above Water’ through The Avril Lavigne Foundation. The Foundation has launched a charitable t-shirt campaign that will raise funds to directly impact individuals affected by Lyme that wouldn’t otherwise be able to afford treatment. 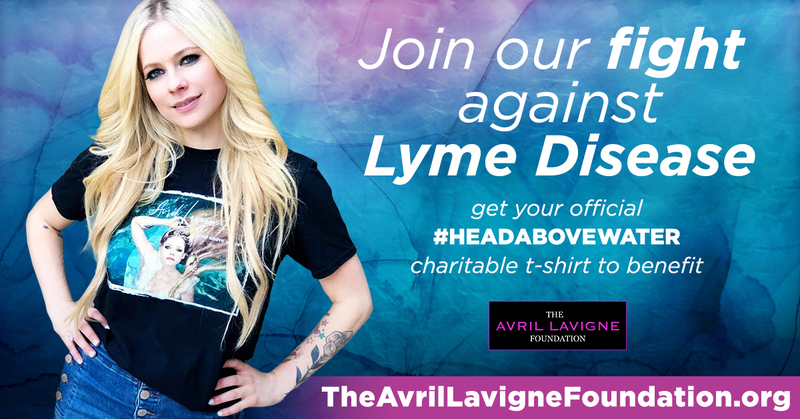 Feeling the need to bring awareness to the severity of Lyme Disease, Avril and her Foundation have made the EXCLUSIVE #HeadAboveWater charitable t-shirt available below or by visiting the website. “Head Above Water” – NOW AVAILABLE! Avril’s first single in 5 years, “Head Above Water” from her upcoming (untitled) 6th album, is NOW AVAILABLE! Get this song wherever you buy/listen to music. I was really surprised by this – in a good way! Her vocals are strong and it has a sort of haunting “Alice” feel. The imagery is very prominent and I can’t wait to see the music video! It’s not poppy like her past, so not sure how radio will deal with it, but for us waiting 5 years, this is a solid debut!! I’d love to hear what you think of the song in the comments. 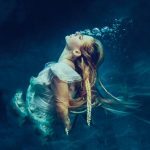 “Head Above Water” – out September 19? Nothing has officially been announced yet, but a new song was registered on ASCAP. “Head Above Water,” written by Avril along with Travis Clark (We The Kings) and Stephan Moccio. The title fits the visuals that Avril has recently described . 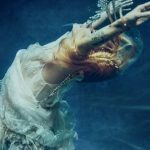 The music video will feature her in water and at a recent album cover photo shoot, Avril said she was “wrecking her makeup” being in under water. 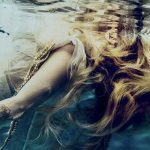 Whatever the first single is – “Head Above Water” or something else – it will be released this month (rumored date is September 19). A good guess is that it will touch on Avril’s recent battle with Lyme disease. Welcome to the NEW Avril-L.org! Since Avril is prepping her epic comeback, I felt that it was a time for a more responsive, modern website. Enjoy the new look and new/updated content and leave a comment with what you think. Thanks to Never Enough Design for the design. There are some pages I am still working on, but if you see anything out of place, please email me. One other thing: if you want to see old news posts, you can still do so here. Avril’s Instagram is WIPED / Possible song title! There is also a new song registered to ASCAP called “Head Above Water”, written by Avril, Travis Clark (We The Kings) and Stephan Moccio (songwriter/producer). Given the clues that this video involves water, this might be a great guess for the first single! 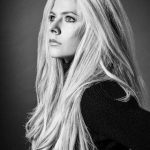 Avril-L.org has been converted to a brand new system, but all old news (2010 – August 2018) will still be available to see here.